Drinking more than one drink a day can take years off your life! If you regularly drink more than the recommended one drink per day, you're taking years off your life, according to a major report. The international study, which looked at 600,000 drinkers, estimated that having 10 to 15 alcoholic drinks a week could shorten a person's life by between one and two years. What's more, the researchers warned that people who drink more than 18 drinks a week could lose four to five years of their lives. Read on for more. Fourteen units of alcohol is equivalent to six pints of beer or seven glasses of wine. The researchers behind the study said their findings support the new guidelines. 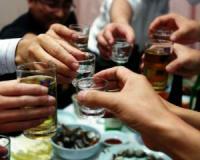 Major report warns that exceeding these drinking guidelines can take years off your life! The Lancet study found that people who drank the equivalent of about five to 10 drinks a week could shorten their lives up to six months. However, it didn’t find an increased risk of death for light drinkers. Furthermore, the researchers found that drinking increased the risk of cardiovascular illness, with every 2.5 units of alcohol people drank above the guidelines significantly raising their risk. They also linked drinking alcohol to a reduced risk of non-fatal heart disease, but said this benefit was wiped out by a higher risk of other forms of the illness. While a body of previous studies have suggested that drinking red wine has heart health benefits, some researchers say these benefits may be overhyped. “This study makes clear that on balance there are no health benefits from drinking alcohol, which is usually the case when things sound too good to be true,” said Tim Chico, professor of cardiovascular medicine at the University of Sheffield in the United Kingdom, who wasn’t involved in the research. “Although non-fatal heart attacks are less likely in people who drink, this benefit is swamped by the increased risk of other forms of heart disease including fatal heart attacks and stroke,” Chico added.